Ilikai Marina sits on the western edge of Waikiki. I am told it is the site where the Skipper and crew of Gilligan's Island began their adventure. I painted this original watercolor from the 11th floor lanai (balcony) of the Ilikai Marina Condos looking down on the boats at anchor. 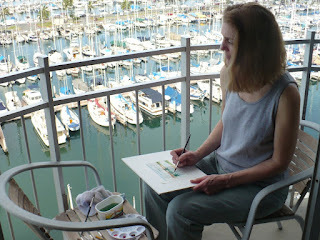 This piece was painted at a time of day when the sun was higher in the sky than in my early morning scenes. The stronger sunlight turned the water a bright shade of turquoise and created strong shadows and highlights making this a colorful painting! 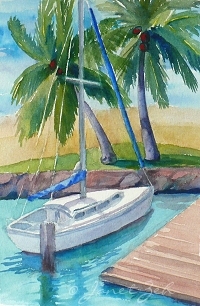 "Ilikai Marina" original watercolor is available for sale in my Original Art Shop!